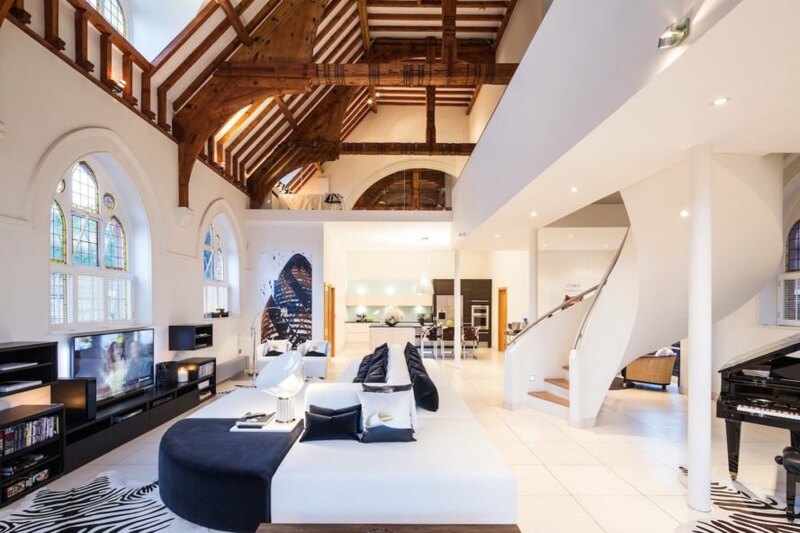 An old Victorian-style church in London was transformed into a gorgeous modern home that belies its historic exterior. 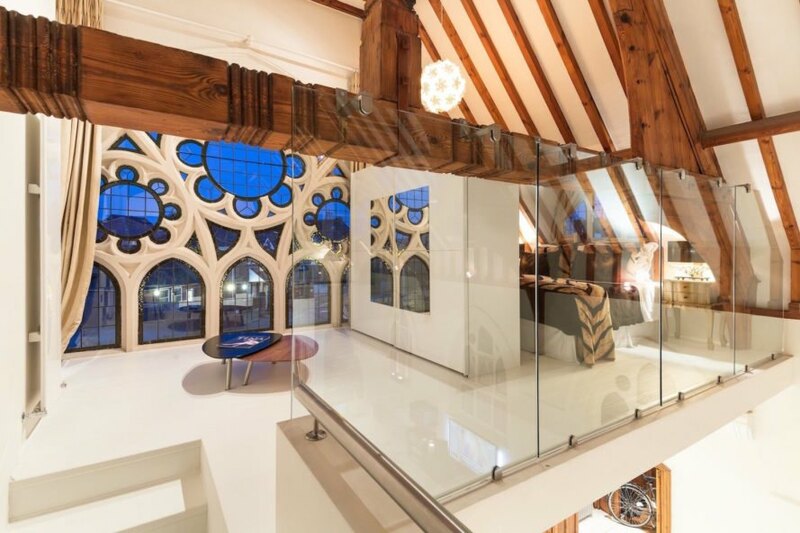 Purchased by local interior designer Gianna Camilotti in 2013, this late 19th century church was gutted and converted into a contemporary home and office that still retains the building’s historic charms. Gianna Camilotti Interiors designed much of the furniture in-house within the Grade II-listed property. Located in Chingford, North East London, The James Spicer Memorial Church Hall School had served as a school and meeting place. 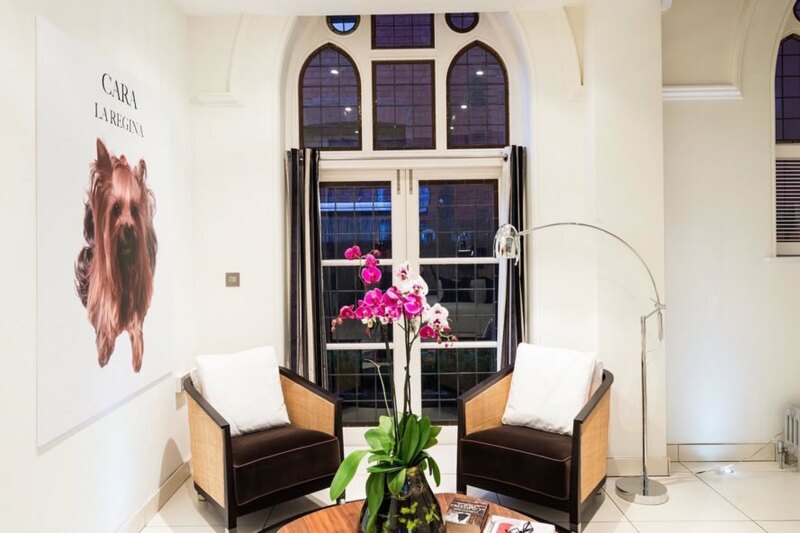 In 2013, Camilotti snapped up the property and gave the tired building a luxurious makeover. 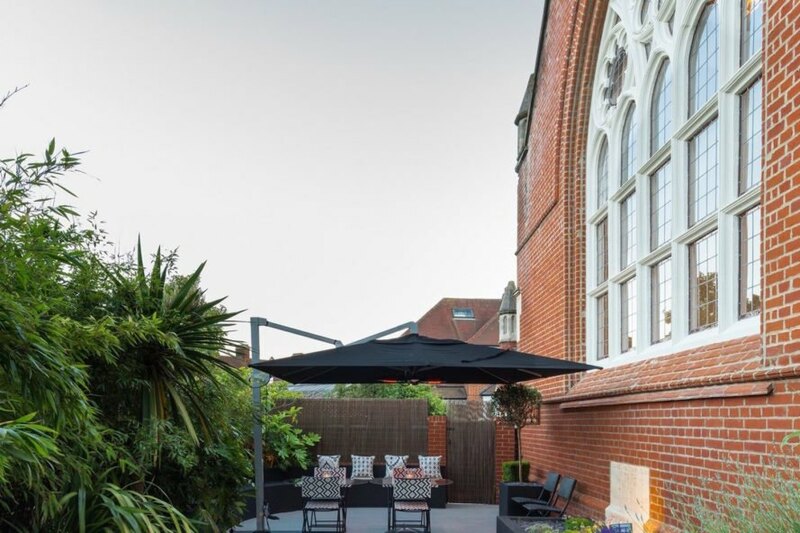 The goal was to create a unique space that could accommodate intimate gatherings of friends with “an atmosphere of London piano-bars.” The award-winning church conversion project was recently put up for rent on Portico. 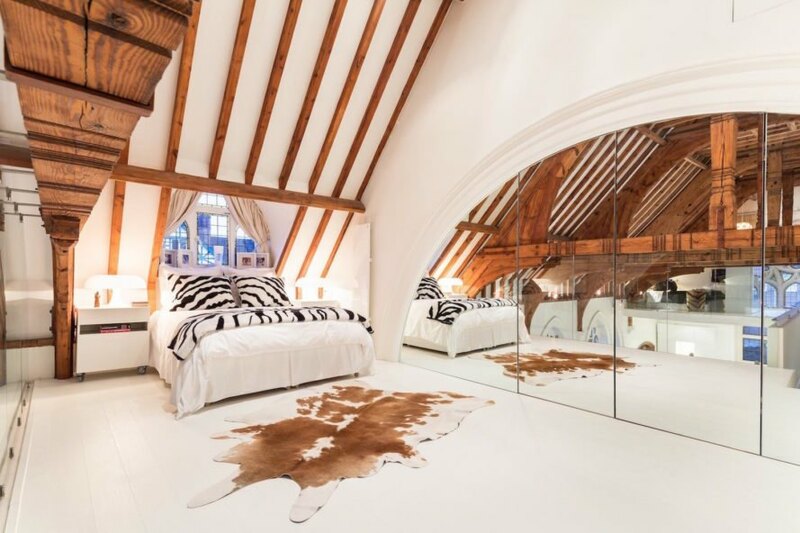 The 237-square-meter building’s original vaulted doors and windows were preserved and the curved oak beams exposed. The interior features an open-plan design with a spacious living room, dining area, and kitchen on the first floor and a master bedroom with ensuite bathroom as well as a second bedroom on the upper floor. The vaulted ceiling reaches 9 meters in height in the middle of the home. Luxury amenities include underfloor heating installed throughout the interior, granite countertops, a self-playing digital piano, and an assortment of furnishings designed by Camilotti. The lavish interiors also open up to an outdoor garden area and patio with seating. 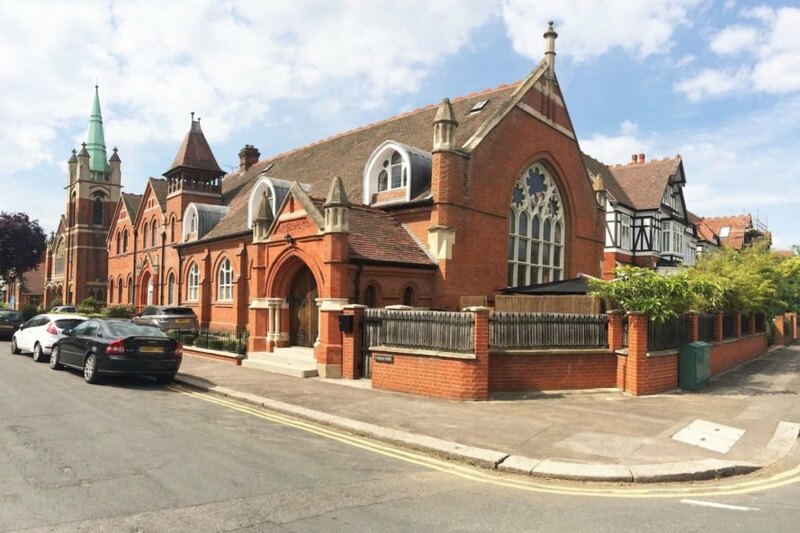 Located in Chingford, North East London, The James Spicer Memorial Church Hall School had served as a school and meeting place. In 2013, Camilotti snapped up the property and gave the tired building a luxurious makeover. 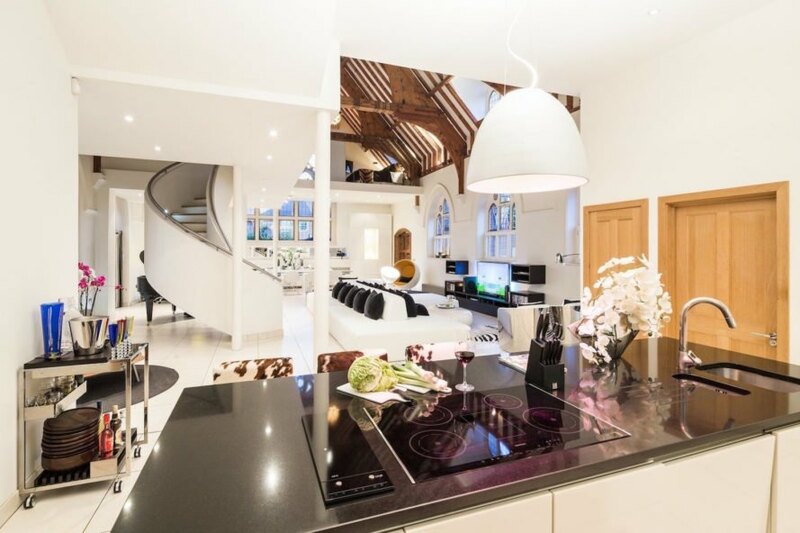 The award-winning church conversion project was recently put up for rent on Portico. The 237-square-meter building’s original vaulted doors and windows were preserved and the curved oak beams exposed. The interior features an open-plan design with a spacious living room, dining area, and kitchen on the first floor and a master bedroom with ensuite bathroom as well as a second bedroom on the upper floor. The vaulted ceiling reaches 9 meters in height in the middle of the home. Luxury amenities include underfloor heating installed throughout the interior, granite countertops, a self-playing digital piano, and an assortment of furnishings designed by Camilotti. The lavish interiors also open up to an outdoor garden area and patio with seating.